Payday came around, which obviously meant a sneaky trip to Boots was in order. The make up was still on 3 for 2 so I thought I'd treat myself to a few bits I've been eyeing up. 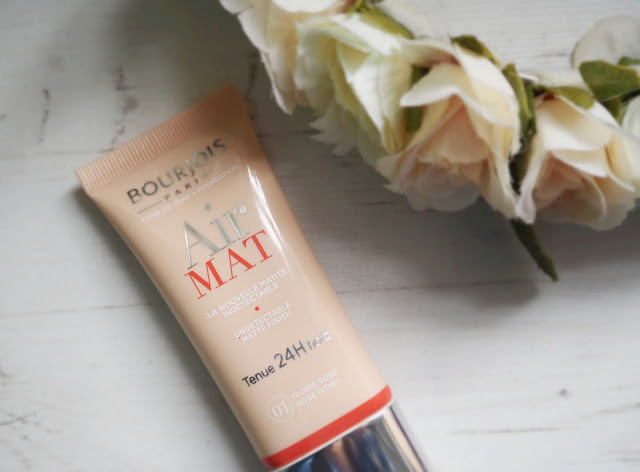 I really wanted to try the new Bourjois Air Mat foundation as I've read good things about it. Once again Bourjois have pulled it out the bag and made a pretty amazing drugstore foundation. In the past I've been an avid lover of their Healthy Mix foundation, but I have to say I think this may have topped it. I'm not generally a huge fan of the matte look. I think it can sometimes look like a mask over your skin and certainly doesn't give that natural look. However this foundation leaves you matte but natural looking at the same time. Despite suffering from dry skin, my nose can sometimes become a little shiny throughout the day. I tried this foundation over a good 10 hours and there was no shine in sight. Plus it doesn't seem to cling to my dry patches as much as other foundations do. I picked up the shade 01 Ivory Rose which I think is a little misleading as I feel this is quite yellow toned. The coverage is great and really evens out the skin tone. I didn't really feel the need to have to apply concealer with this foundation as it does the job for you, without feeling really heavy. I'd say this is medium coverage but definitely buildable to a fuller coverage if that's what you're looking for. My only tiny negative is the scent. It's a little overpowering at first but does disappear after a few minutes. Overall this certainly has a thumbs up from me.